Showing 35 articles from January 28, 2015. YOUNGSVILLE -- When most officers roll up on a suspicious vehicle, they prepare themselves to dispense enforcement of the law. Det. 1st Sgt. Ronald Adkins, though, was ready with another tool -- compassion. He responded to the Ace Hardware parking lot the morning of Jan. 22 to check on a report of a suspicious vehicle. According to the report, the Ford pickup truck had been sitting there at least two days. LOUISBURG -- The organization that oversees the development of four regional business parks is looking to a Raleigh commercial group to market the sites. One of their first orders of business -- at least on the table for discussion -- is dropping the asking price for land at the Franklin County site. 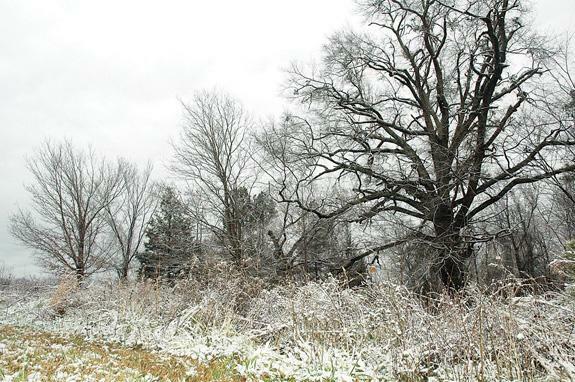 Franklin County woke up Tuesday morning to a surprise dusting of white, not enough to cause serious problems, but enough to remind everyone that it's late January and the region is still very much in the clutches of winter. Although the dusting of snow wasn't forecast, local youngsters were thrilled even though it wasn't enough to close, or even delay, schools. LOUISBURG -- Residents will get a chance next month to speak about the county's plan to fund courthouse renovations and a school land purchase that, with no fiscal changes, could cost taxpayers an extra half-cent on the tax rate. Finance officials, though, were quick to note that a correlative rise in taxes was not a given. The county has figured that it will need to borrow $2 million to cover the cost of renovating the county courthouse, plus the $600,000 it has agreed it would provide the school system to buy 60 acres next to Louisburg High School for expansion of athletic facilities. LOUISBURG -- A Harlem Globetrotter "Legend" visited two Vance-Granville Community College campuses, including the one in Louisburg, passing out his message: education is the only surefire path to success. 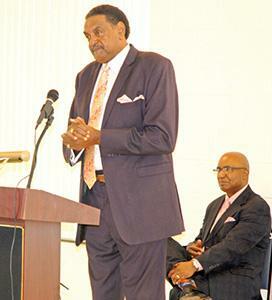 Raleigh native James "Twiggy" Sanders, who played with the Globetrotters from 1974 until 1991, spoke first at VGCC's Franklin County Campus near Louisburg and later in the Civic Center on the college's Main Campus in Henderson. What if a foreign corporation tried to seize your land? With only a few hours to count off before the big game (we're not supposed to say Super Bowl! ), here's a riddle to ponder while you tick off the seconds. First, pretend you are lucky enough to have inherited, debt free (this is a dream, after all) a large farm in this country where it has been protected, preserved and used by your ancestors for 100 or 200 years. Beginning in February, there will be events happening around Franklin County that every adult should pay attention to -- and some should offer their input. February is when local government boards begin to discuss their 2015-16 budgets that will begin on July 1 and affect virtually all of us. When did the White House turn into Mr. Wilson's front yard? It was reported earlier this week that someone crashed a drone -- essentially -- in the southeast corner of the White House lawn. It seems that going back a few months, some unwanted -- annoying person -- has found their way over the fence of what is supposed to be the most heavily guarded home in the country. "If he enters school property without cause, he will be arrested for trespassing," is a quote from an email sent by the Franklin County Schools public information officer to school principals, and others, including the Sheriff's Department and other law enforcement. Additional text includes, "is looking to collect statements, information, and opinions regarding school safety - do not comment." Regardless of political philosophy, incumbency, or affiliation, political candidates invariably promise to fight waste, fraud and abuse in government. 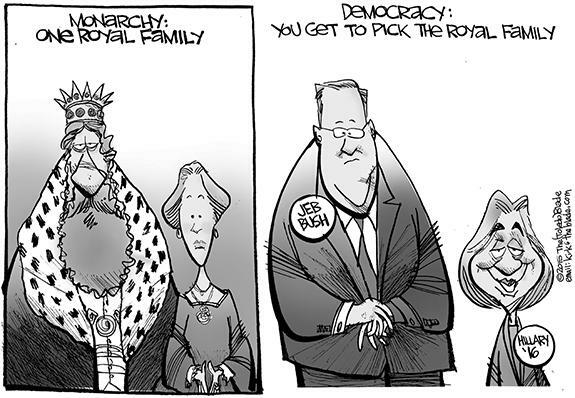 Let's take a look at how our New Republican Congress, (with a little help from some Senate Democrats), is doing. 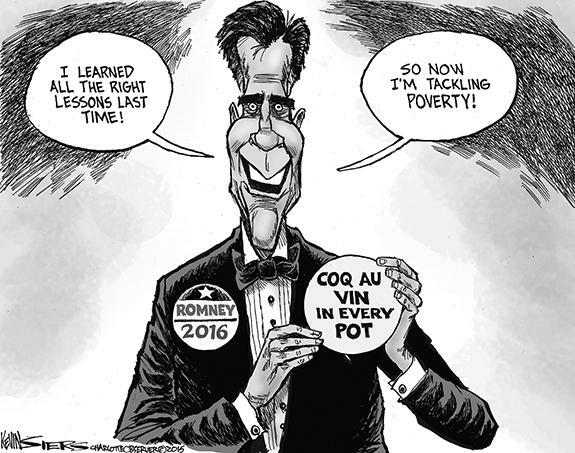 Speaker John Boehner looks like living proof of the Peter Principle. He had to pull an anti-choice bill, (HR36), at the last minute due to another internal insurrection. FRANKLINTON - Adell Cash Wynne (94) went to be with her Lord and Savior on January 26, 2015. She loved the Lord, her family and Franklinton Baptist Church where she served humbly and faithfully for sixty-four years. Her Bible Study Group, which she fondly called "Her Girls," held a special place in her heart. FRANKLINTON --Funeral services for Russell Leroy "Pa Pa" Person, 84, who died Tuesday, Jan. 27, 2015, will be held at 1 p.m. Saturday, Jan. 31, at Greater Ransom Way of the Cross Temple, with the Rev. Michael Alston officiating. Burial will follow in the church cemetery. SMITH SHINES. Franklinton High School's Smith Gupton (left) drives toward the basket for the Red Rams during Tuesday night's road basketball loss against Northern Carolina Conference rival Warren County in Warrenton. 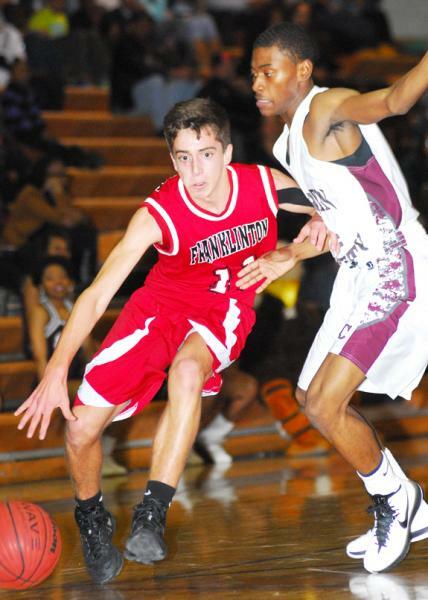 For Franklinton to finish in one of the top two spots in the Northern Carolina Conference boys basketball standings, it was almost imperative for the Red Rams to leave Warren County with a victory Tuesday night. For three periods, Franklinton appeared on the cusp of that goal, only to see WC respond down the stretch for a 62-55 decision at the WCHS Gymnasium. FLOOR GENERAL. 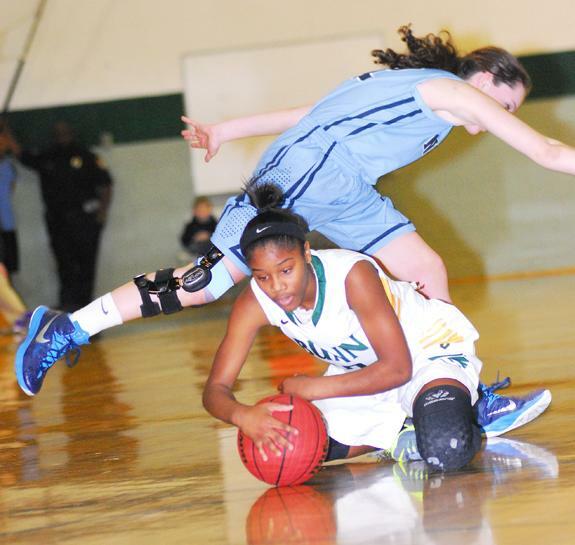 Bunn's Bernadette Cooke dives to the court to gain possession of the ball during last Wednesday's home hoops triumph. 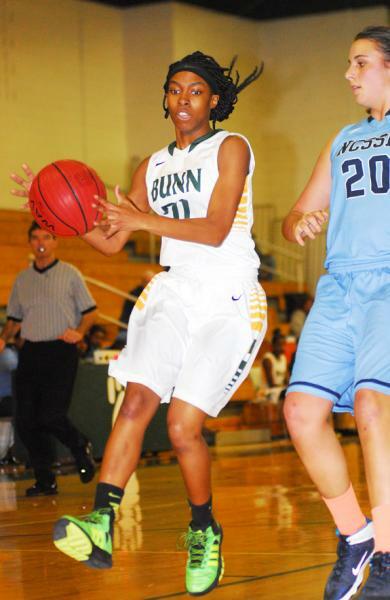 BUNN -- Bunn's full-court pressure defense has wreaked havoc on plenty of opponents this season, but that scenario didn't play out during Tuesday's road girls basketball meeting at South Granville. The effectiveness of Bunn's press was limited early on, so head coach Matt Keith opted to switch to a tight man-to-man strategy. DORSEY GETS THE JOB DONE. 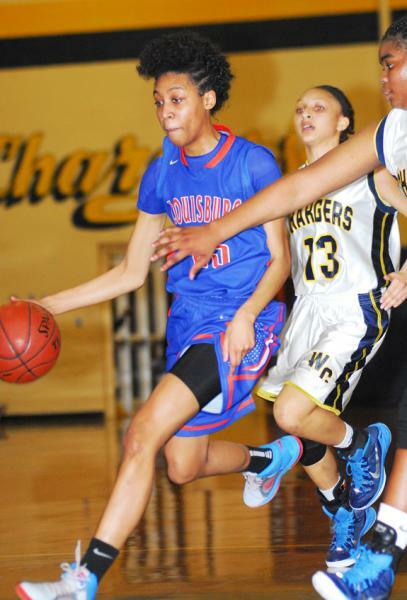 Louisburg College's Sycoya Dorsey comes through with a basket against Cape Fear. 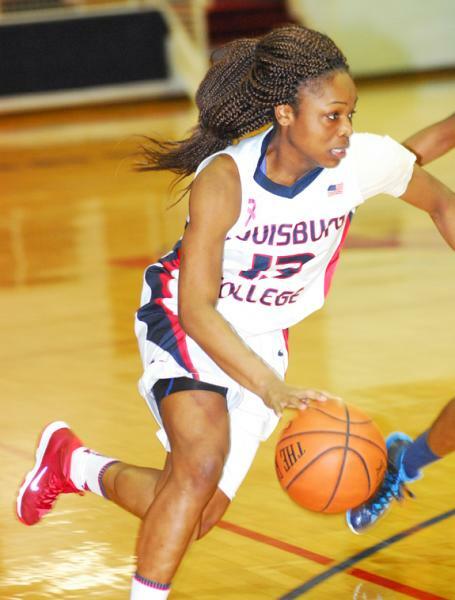 LOUISBURG -- If the sign of a good team is how it responds from a loss, the Louisburg College Lady Hurricanes could be a force down the stretch in Region X women's basketball action. LC has dropped four contests this season -- and came back to immediately record a double-digit decision in its next outing. Louisburg's latest bounceback came last week after Wednesday's disappointing home loss against league foe Cape Fear Community College. WELDON -- Earlier in the season, Louisburg High School first-year girls basketball coach Mike Sheldon bemoaned the fact that his club's improvement -- however evident -- wasn't resulting in victories. That fact has changed in the past week as Louisburg has notched a pair of key victories -- and put itself back into the thick of the race in the Tar-Roanoke Athletic Conference standings. 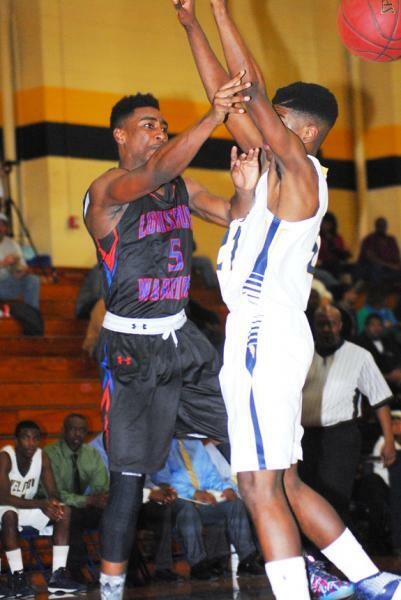 WELDON -- The last time the teams met, Weldon edged Louisburg in an overtime thriller in the championship game of the Tar-Roanoke Athletic Conference Boys Basketball Tournament last February. Last Friday's rematch didn't have quite the same stakes, though both squads are in the process of jousting for position to earn a spot in the Class 1-A State Playoffs. IF THERE'S A WALL, THERE'S A WAY. 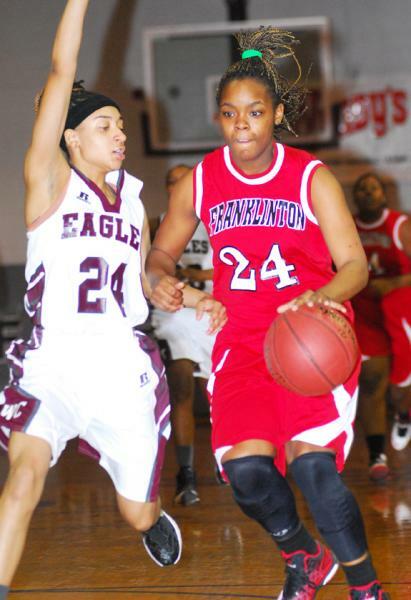 Franklinton High School's Tanisha Wall (right) drives for two points during the Lady Rams' road defeat on Tuesday night against Warren County. WARRENTON -- To say Franklinton was shorthanded for its girls basketball matchup at Warren County is a bit of an understatement -- and not just concerning FHS' six-person varsity roster. The Lady Rams were also without head coach Lester Wilder and assistant coach Danny Wilder due to illness, leaving assistant Edith Debnam to oversee a lonely bench. HENDERSON -- The Vance-Granville Community College Vanguards snapped a four-game losing streak and achieved their first conference win of the 2014-15 men's basketball season with a victory over Guilford Technical Community College last Saturday. Playing on the Vanguards' home court, Aycock Recreation Center in Henderson, the teams appeared to be evenly matched in the first half. SAILING. 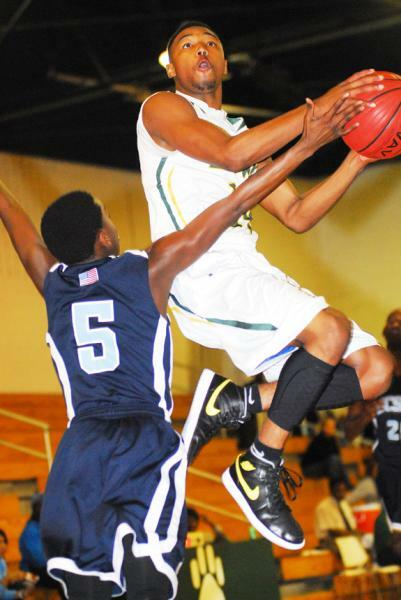 Bunn's Quenten Wright (right) elevates for a bucket last Wednesday night against the NCSSM Unicorns. BUNN -- Coming off a huge victory over Franklinton one night earlier, Bunn had a golden opportunity to keep its Northern Carolina Conference boys basketball momentum going with a home meeting last Wednesday against North Carolina School of Science and Math. But it wasn't to be as BHS was defeated by the Unicorns by a 43-32 margin in an offensively challenged showdown at the Bunn Dome. HENDERSON -- Union Bank is partnering with the Vance-Granville Community College Endowment Fund to present the college's annual golf tournament in 2015. The 31st Annual Golf Tournament will be held on Tuesday, May 5, at Henderson Country Club. Vance-Granville Community College's Endowment Fund provides hundreds of scholarships each year to students from the same area and beyond. 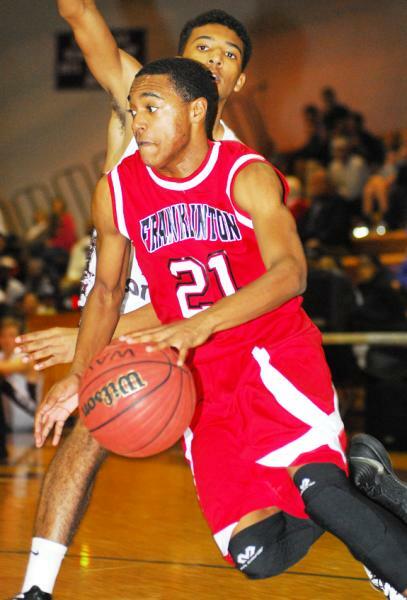 Franklinton's Tre Gaither drives for a basket during Tuesday's road defeat at Warren County. 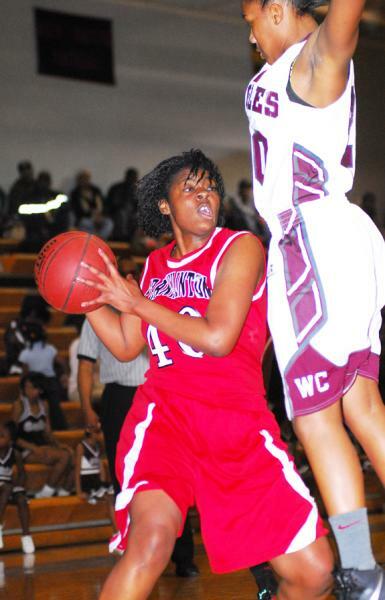 Franklinton's Bria Gaither scores in the paint. Bunn's Jonasha Green (left) picks up a bucket during last Wednesday night's home league decision against North Carolina School of Science and Math. 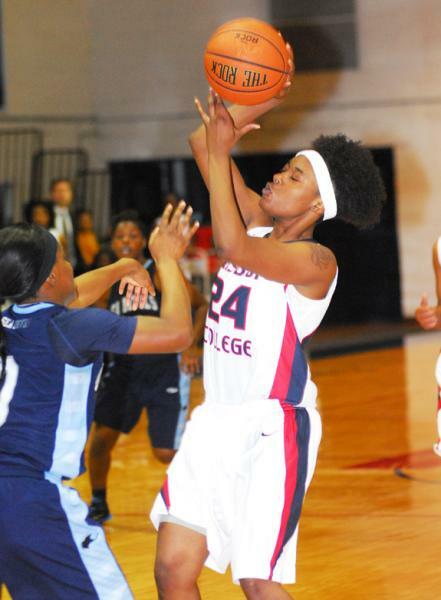 Louisburg College's Zana Tatum (right) goes up for a jumper last Wednesday against Cape Fear Community College at the Taylor Center. During the 1850s and 1860s, Thomas K. Thomas, a lawyer in Louisburg, tried his hand at mining gold at the site of the Portis gold mine and then sold most of his landholdings in the area to the Portis Gold Mining Company -- a corporation he had helped to establish. Although Thomas made money as a miner (a census taker in 1860 recorded the value of his real and personal property at more than $75,000), the real estate transaction greatly enhanced his liquid assets. Dr. Phillip and Judy Stover of Louisburg announce the engagement of their daughter, Ashley Danielle Stover of Wake Forest, to Samuel Jackson Craig IV of Wake Forest. The groom-elect is the son of Harold and Melissa Pridgen of Denton, N.C. 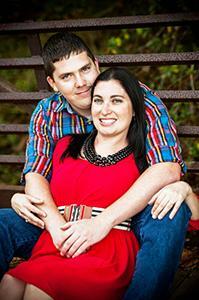 The wedding will take place on June 20, 2015 at 3:30 p.m. at Louisburg United Methodist Church in Louisburg. Reception will follow at Boondocks in Youngsville. 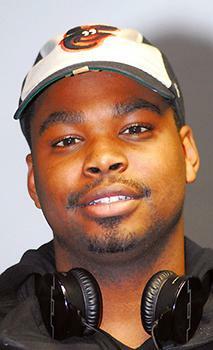 The 2015 season at Cherry Hill in Warren County begins Feb. 8 with a performance by tenor Timothy Sparks. 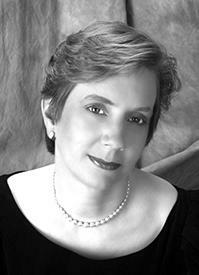 He will be accompanied on the piano by Deborah Hollis as he presents works by Ralph Vaughan Williams, Faure', Britten, and Schuman. The concert is scheduled for 3 p.m. and will be followed by a reception and conversation with the performers. BUNN -- Town officials have narrowed their gaze for a potential new police chief to half a dozen. During a special-called meeting last week, commissioners reviewed 16 applications, selecting six candidates who will be subjected to background checks, then interviews. 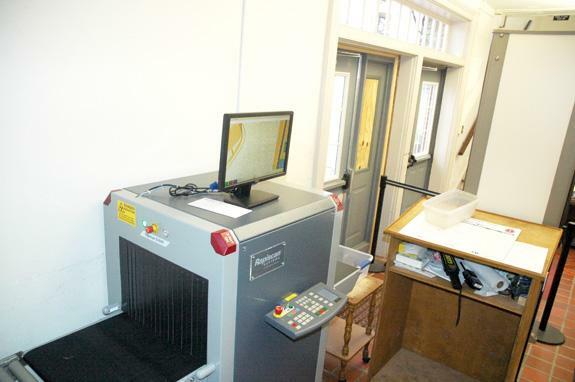 "[Commissioners] are planning to take their time and do a very thorough search to make sure they get the right candidate," said Town Clerk Judy Jeffreys. YOUNGSVLLE -- The State Highway Patrol is investigating a fatal wreck over the weekend. According to the agency, a single-vehicle wreck was reported at about 10:30 p.m. on Jan. 24 at the intersection of Bethlehem Church and Darius Pearce roads. The identity of the decedent has not been released and neither have any details surrounding the accident. YOUNGSVILLE -- Franklin County sheriff's deputies are looking for suspects who shot a hole in a fire department door. According to authorities, a fire department member was at Station No. 3 in the 6700 block of N.C. 96 near U.S. 401 the evening of Jan. 26 when he heard a gunshot. BUNN -- Duncan Younger earned the highest rank of Eagle Scout with the Boy Scouts of America. Duncan, from Bunn, was awarded the rank this past October. His ceremony will be held in April at the Louisburg Methodist Church after the high school wrestling season is over. Duncan has been in Scouting for 10 years and is a member of Troop 555 in Louisburg.